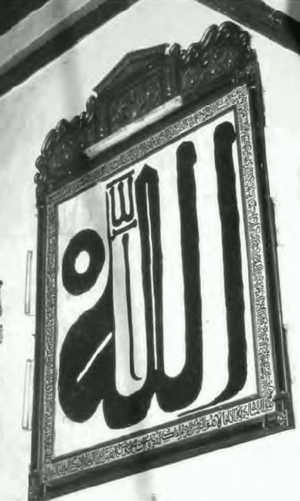 The Supreme Name calligraphed by Shaykh al-Qandusi, adorning the Moulay Idris II Mosque in Morocco. HE IS SAYYIDI ABU ‘ABDILLAH MUHAMMAD B. AL-QASIM AL-QANDUSI (d. 1278 AH/1861 CE), the hidden Gnostic enraptured in the love of Allah and His Messenger (peace and blessings be upon him) and drowned in the oceans of spiritual realities. Originally from Algeria, Shaykh Muhammad b. al-Qasim al-Qandusi migrated to Fez, Morocco in 1244 AH/1828 CE, where he lived a life of relative obscurity selling medicinal herbs and spices in the marketplace. By outward appearances he looked unremarkable, but those endowed with spiritual insight could see that he was blessed with sainthood and an intimate connection with the Messenger of Allah (peace and blessings be upon him). The Shaykh’s spiritual affiliation was through the Qadiri and Nasiri orders. Toward the end of his life, the Shaykh began to disclose some of the spiritual secrets bestowed upon him, and wrote a number of works showing his mastery of the spiritual sciences. The most famous of his works was Sharab Ahl al-Safa fi al-Salat ‘ala al-Nabi al-Mustafa (The Drink of the People of Purity in Prayers upon the Chosen Prophet). He is described as the one who wrote the Supreme Name (Allah) in the exquisite, albeit unusual, large script, adorning the Moulay Idris II Mosque in Fez, above the chair reserved for teaching Ibn Abi Zayd al-Qaraywani’s al-Risala in Maliki jurisprudence. He also wrote by hand, in the same unique style of handwriting, a copy of the Qur‘an spanning twelve large volumes, preserved today in the Bibliothèque Générale in Rabat, Morocco. May Allah be pleased with him and bring us benefit through his secret. Amin.